The international automotive industry stands on the cusp of potentially the largest transformation since the dawn of mass production. This will be driven by several concurrent influences, notably electrification and connected and automated vehicle technologies – but perhaps the most profound changes will be in the manner of vehicle use. This is predicted to move from a model dominated by personal vehicle ownership and use to one predicated on the provision of Mobility-as-a-Service (MaaS). This transformation offers the potential to radically improve the current very low levels of asset utilization for passenger cars and as a sub-sector is already growing significantly faster than the auto industry as a whole. The technological and social drivers and enablers for this change are developing extremely rapidly. Vehicle-to-vehicle (V2V) and vehicle-to-infrastructure (V2I) connectivity, supported by fast 5G data services and blockchain payment authentication, is developing in parallel to the development of SAE Level-4 automated driving technology. At the same time, insurance models and legislation are both beginning to allow driverless vehicles onto public roads. This emerging transportation ecosystem supports the economically viable introduction of robotic taxis, automated shuttles and delivery drones for urban environments. The Ricardo white paper, Identifying markets for future mobility services, published today, outlines the key steps that companies within the existing automotive value chain should take when bringing MaaS innovations to market. The paper draws in particular upon an in-depth field market study conducted by Ricardo on the city of Paris, France, to characterize existing mobility services and benchmark their potential future market size. Key findings of this study are included in the paper and will be explored more fully in the upcoming webinar. In terms of the costs of the automated vehicle technologies that will enable MaaS innovations, Ricardo analysis suggests that the cost per mile of robotic taxis will be around half that of personal car ownership, even if the autonomous technology is significantly more expensive than that of traditional vehicles. As people start to share taxi rides, the cost per mile falls to less than 17 percent of the cost of personal cars. Figures like these indicate that the tipping point away from personal car ownership in city zones that can be well served by robotic vehicles could arrive very soon, with traditional ride-hailing and vehicle rentals continuing to service travel outside city zones. Overall, Ricardo believes that both the business case and regulatory framework are likely to be strong enough by 2022 to allow the commercial development of MaaS in urban environments. Software and service innovations are increasingly the defining driver for MaaS innovations, presenting a highly disruptive and competitive ecosystem for new entrants and existing players alike, but one that is also extremely rich in opportunity. This situation, however, poses a risk for automakers that their products become commoditized, with mobility services and software functionality becoming the primary commercial product differentiators and thus the drivers of profits. The white paper aims to help those in the existing automotive value chain to navigate this complex set of opportunities and risks, and chart a strategy to exploit the commercial potential of MaaS rather than regarding is as a threat. 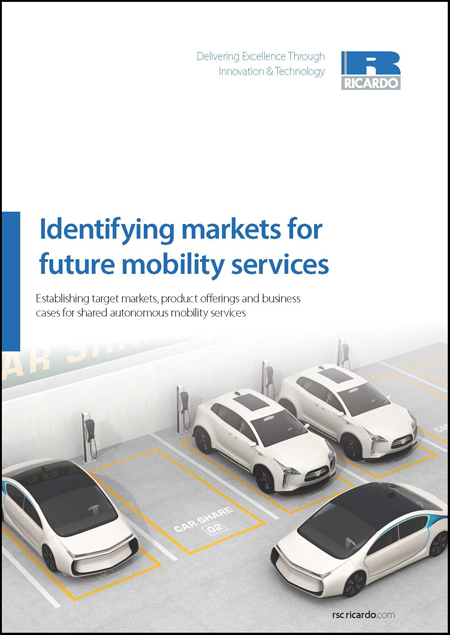 To obtain a free download of the Ricardo white paper Identifying markets for future mobility services, visit the Ricardo eStore https://estore.ricardo.com/store/publications/identifying-markets-for-future-mobility-services/c-23/c-70/p-417, or to request free delegate registration for the webinar visit https://attendee.gotowebinar.com/register/8967663411801877261?source=pr.